This soup is somewhat similar to the former except with egg instead of rice noodles, and Chinese flavorings of 5-spice powder and soy sauce. 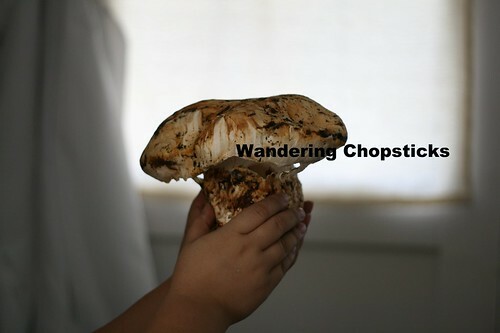 I used the matsutake mushrooms my dad had foraged in the Oregon forest that I brought back from my $41.40 roundtrip flight to Portland. My mom likes to add in lotus seeds, wolfberries, and dried dates, but I totally forgot about adding those ingredients in my version. 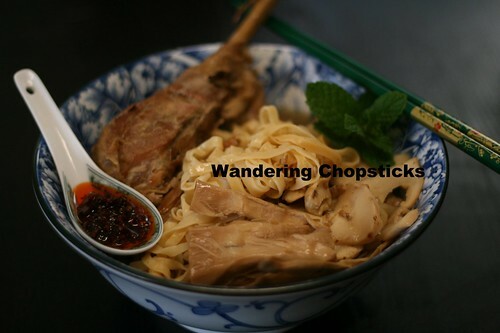 Nonetheless, with Chinese chili oil to round out the flavors, it was still a delicious bowl. 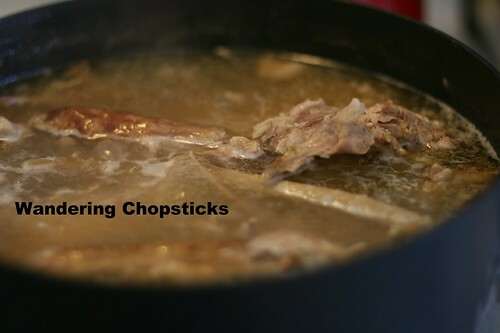 Fill a 5-quart stock pot with the leftover turkey bones and set on the stove to boil. Then turn the heat down to medium-low, toss in 1 large onion, 3 star anise pods, the slices of ginger, 1 tsp sugar, and let simmer for about an hour. Meanwhile, shred the turkey meat and toss with 1/2 tsp Chinese five-spice powder and 1 tblsp soy sauce. Set aside. Boil the dried bamboo shoots to reduce the pungency if you wish. Cut into about 3-inch long pieces and add to the pot. Slice 1 cup fresh matsutake mushrooms or soak 1 cup dried shiitake mushrooms in hot water for about 5 minutes. When the mushrooms have softened, snip off the stem with a pair of scissors. Wash the mushrooms to remove any excess dirt and slice them in half. Add the shiitake mushrooms to the pot. 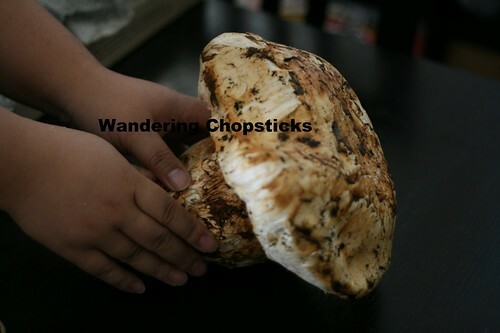 Fresh matsutake mushrooms should be saved near the end. The matsutake mushrooms my dad sent down were huge. Gourmet Pigs was over for lunch so she took pictures with me holding them for comparison. 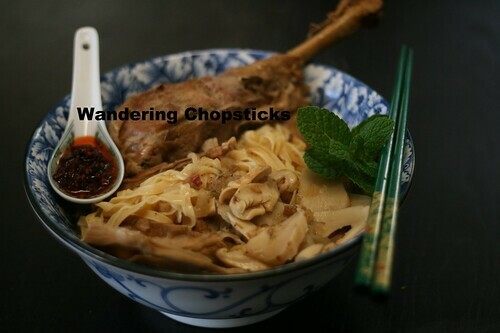 At about 45 minutes, taste the stock, adding about 1 tblsp of fish sauce or more if necessary. Add the fresh mushrooms if you're using them. Let simmer for a few minutes more while you boil the water to cook the egg noodles. 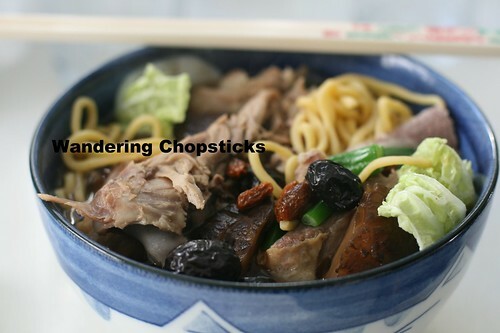 To serve, layer a bowl with the egg noodles. 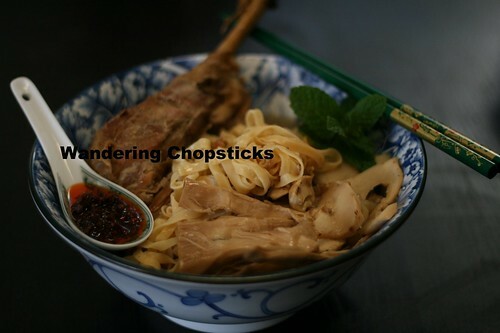 Spoon broth, turkey, mushrooms, and bamboo shoots over the noodles. Garnish with whatever greens you'd like. My parents were in town for Thanksgiving this year, so my mom used the leftover turkey to make her version with dried dates, lotus seeds, wolfberries. 1 year ago today, lil' sis' Pumpkin Marbled Cheesecake. 2 years ago today, Taro Dinner Rolls. 3 years ago today, Kong Namul (Korean Seasoned Soy Bean Sprouts). 4 years ago today, bougainvillea, gladiolus, and Chicago Peace rose.